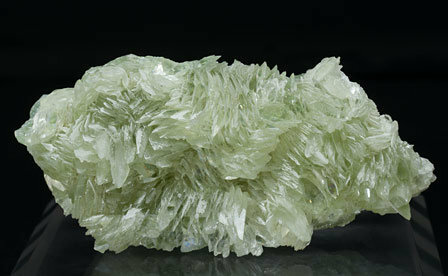 Fan-like growths of very Sharp Tarbuttite crystals with very well defined faces and edges, translucent, bright and with a very uniform green color. The sample is of great quality both for the species and for its locality. 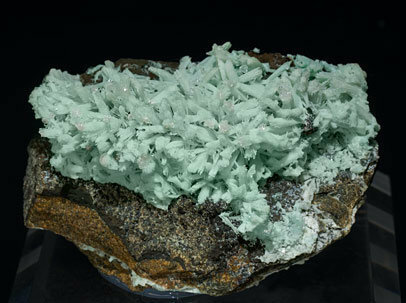 Fanlike growths of acicular Hydroxylapatite and Hemimorphite micro-crystals on Tarbuttite crystals, distinguishable by its green color. Of high quality, as is usual with samples from the Desmond Sacco collection. 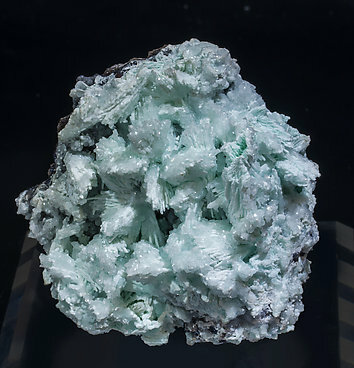 Fanlike growths of Hydroxylapatite and Hemimorphite micro-crystals on Tarbuttite partially dissolved but distinguishable on the back side of the sample due to its green color. The three co-existing species on the sample have been analyzed and we will send a copy of the analyses to the buyer. 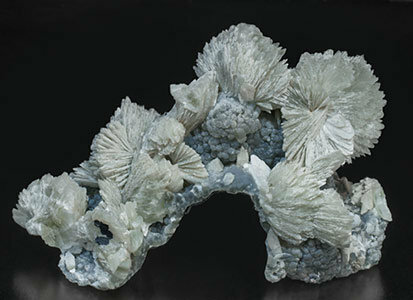 Divergent growths, on matrix, of acicular Tarbuttite crystals with a pale green color and partially coated by white Hydroxylapatite and Hemimorphite micro-crystals. The three co-existing species on the sample have been analyzed and we will send a copy of the analyses to the buyer. 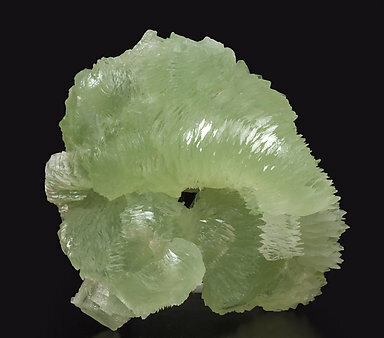 Swirling platy growths of very sharp Tarbuttite crystals, transparent, bright and with a uniform pale green color, they are partially coated by white Hydroxylapatite and Hemimorphite micro-crystals. The three co-existing species on the sample have been analyzed and we will send a copy of the analyses to the buyer. A very special “museum quality” sample from the type locality for the species. 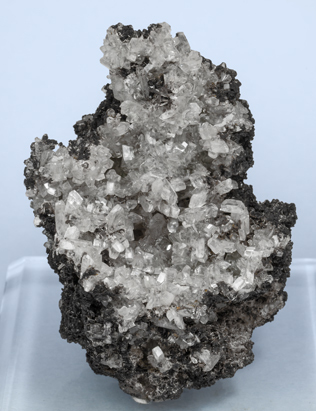 It is very rich in Tarbuttite crystals that are on a limonite matrix. The crystals, of great quality, are extraordinarily sharp, colorless, clear and very bright. 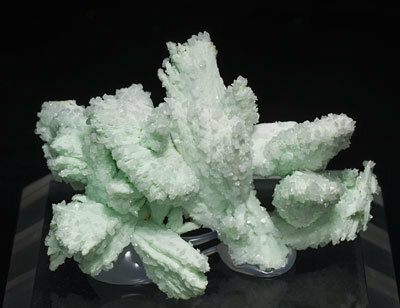 Also on the matrix there are white, acicular Scholzite crystals and creamy colored Parascholzite crystals. Fan-like sprays of Tarbuttite crystals with very acute terminations, very well defined faces and edges and on matrix, with violet botryoidal Smithsonite. The sample, very esthetic and of a great quality for the species, is from the Desmond Sacco collection whose label we’ll send to the buyer.